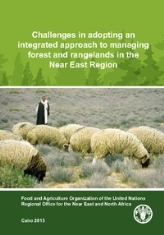 Rangelands and forests together account for a major chunk of land in the Near East region. Characterized by semi-arid and arid conditions use of these land faces very severe constraints, which have been accentuated on account of climate change related extreme weather events. Larger changes, especially population growth, changing aspirations of the people, development of markets, globalization, etc. have directly and indirectly affected forests and rangelands. In most countries they are on a path of deterioration affecting the provision of goods and services provided to society, especially undermining the livelihood of local communities.